What is Chain of Custody and What Role Does It Play in Paper Shredding? What is Chain of Custody and What Role Does It Play In Shredding? Chain of custody has several meanings, but relating to the document shredding industry it’s specifically referencing a paper trail that tracks the document destruction process. Shredding sensitive documents is required in many industries and recommended for all businesses. Securely destroying your files keeps the private information of your employees, partners, and customers safe. When using a shredding service, your files are out of your hands, and they move through various stages and processes before being completely destroyed. To eliminate any possible margin of error, the chain of custody is the paper trail that documents and tracks the movement of your files. From pick up to final destruction, the exact stages your files go through are tracked and recorded to ensure the safe and thorough destruction of your materials. How Does the Chain of Custody Tie Into Shredding Services? While service providers are not legally required to diligently track the shredding process, many do. To ensure your service provider performs their duties safely, look for providers who are NAID Certified. Read the “About Us” pages on your shredder’s website, or ask if they provide documentation of the shredding process, and how detailed it is. Every company is different, but common ways documents are tracked are via barcoded boxes and GPS enabled trucks. Records are kept detailing which documents are in certain boxes, and those boxes are tracked throughout the process just like a UPS package would be tracked during delivery. How Can You Be Sure You Received Secure Chain of Custody? Ask your shredding service provider if they provide a Certificate of Destruction. These documents detail the who/what/when/where of the document shredding process. 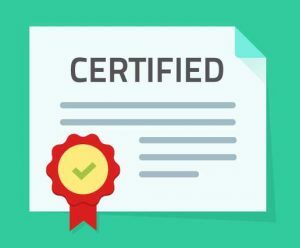 These certificates range in the amount of information they provide: some offer a simple date and witness signature, while others offer weight and location information, terms and conditions, and additional pertinent information. Are There Legal Protections that Apply to Chain of Custody? If your shredding service provider accepts fiduciary responsibility they become legally responsible for what happens to the documents and the information contained within them. Once you transfer custody of documents to the shredding provider, it becomes their responsibility to keep those documents safe, not yours. Why Do I Need Secure Chain of Custody? In the event that legal action is taken against your organization, having a documented secure chain of custody for your document destruction procedures can be incredibly valuable. HIPAA, which applies to organizations in the healthcare industry, requires “reasonable safeguards” be implemented to prevent disclosures of private information. 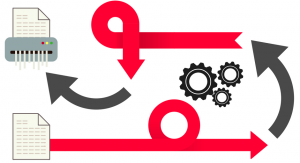 Having proof that your company took the necessary steps towards securing the private information you handle will help protect your organization. 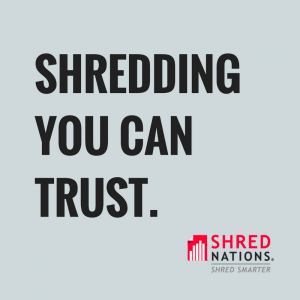 Shred Nations partners with shredding professionals across the country. We provide free quotes from shredding service providers who have been trusted by thousands, including Amazon, Disney, and the NFL. Call (800) 747-3365 or fill out the form on the right to get free quotes on mobile shredding, offsite shredding, hard drive shredding, and more. We look forward to helping you find the right shredding solution for your needs.